Today, Michigan’s public mental health system is administered by the Department of Community Health, (DCH) with most services delivered through 46 Community Mental Health Service Agencies (CMHSPs), who contract with the Department of Community Health and receive appropriations from the Michigan Legislature, a mix of general funds and federal Medicaid funds. The CMHSPs serve persons with mental illness, developmental disabilities and in conjunction with statewide coordinating agencies, substance use disorders. Priorities for service are determined by the Michigan Mental Health Code and by Medicaid eligibility. The Department of Community Health operates 3 state psychiatric hospitals for adults and one for children and adolescents. One state hospital also serves persons with developmental disabilities. The state also operates a forensic hospital. Michigan’s history of state hospital closures has been one of the most aggressive in the nation. Michigan’s shift from hospital care to community-based care was in keeping with the national movement marked by the President Kennedy’s signature of the Mental Retardation Facilities and the Community Mental Health Centers Construction Act of 1963. The new localized community care approach to services in Michigan was codified in 1974, with the passage of the Mental Health Code, Public Act 258 of 1974. In the 1980’s Community Mental Health agencies became “full-management boards” meaning that they were the single entry point into the services, including state hospital services. A major revision of the mental health code was accomplished by Public Act 290 of 1995, which further decentralized responsibility for the system to county-based CMHSPs, which were then allowed to convert to authority status and encouraged to consolidate. The code now defined CMHSP responsibilities to serve persons prioritized by the severity of their mental illness, emotional disturbance or developmental disability. 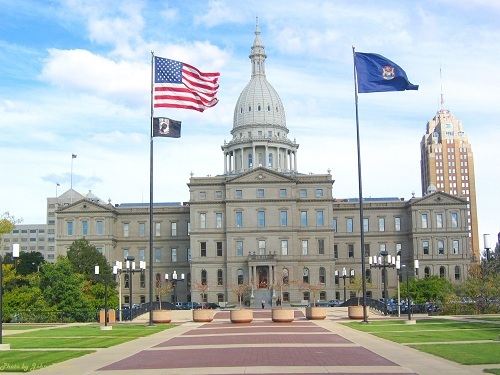 Michigan began to rely increasingly on Medicaid funds to deliver services and at the end of the 90’s, entered into a capitated funding arrangement with the federal Medicaid administration, via a waiver agreement. CMHs then took on new managed care responsibilities. In 2004, Governor Granholm appointed 29 citizens, including legislators, to the Michigan Mental Health Commission, co-chaired by C. Patrick Babcock and Waltraud Prechter and charged with identifying pressing issues and challenges to the system and to make prioritized recommendations. Three MPS members were appointed, Michele Reid, MD, Rajiv Tandon, MD, and Tom Carli, MD. Several members also served on the workgroups. The work of the Commission resulted in a detailed report and recommendations as well as a great deal of accumulated history and analysis. The Commission documents on the MDCH website are a rich source of information on the public system. Few of the Commission’s recommendations were translated into legislation to amend the mental health code, and thus far, two of the bills have passed, one being a legislative priority for MPS: to codify the office of Director of Psychiatric and Medical Services, who must be a psychiatrist, to ensure that an up-to-date and unified medical policy informs the public system. The findings of the Commission and the subsequent delay s in implementation highlight the gap between the mental health needs of the citizens of Michigan and the resources in place to meet those needs. While Michigan has aggressively sought the funding partnership with the federal government, that has resulted in the executive and legislators’ budget decisions that have replaced general funds with Medicaid funds, and subsequently reduced the system’s ability to serve people who are not, or nor yet eligible for Medicaid. This has set up an irreconcilable conflict with the mental health code priorities to serve those most severely ill regardless of their ability to pay. One of the significant findings of the Commission is the inconsistent resources available across the state, resulting in uneven access to services. CMHSPs have a fair amount of latitude in setting local priorities, but their allocated funding is somewhat determined by historical factors that no longer reflect the current environment. Solutions to better distribute and prioritize funding have been elusive. The Commission found that interventions are not made at the early stage and people must often be in crisis to qualify for services. This reality is in contrast with the priority to serve the most seriously ill and highlights the shortfall in funding—which must be addressed. It was also found that effective means do not exist to stop the excessive flow of persons with mental illness and emotional disturbance into the adult and juvenile justice systems. In addition, the state should engage in an active public education campaign as well as support the passage of state mental health parity legislation. There are innovations and good models being carried out within the public systems. An orientation toward recovery and empowerment has yielded positive results and major efforts are underway to integrate mental health care with primary care and substance use disorder programs. Innovations in private and uiversity based health systems have also pointed to new directions for the public system. MPS will work to highlight service innovations in both the public and private health arenas.